If you're looking for cheap car hire in Kissimmee, you can compare deals offered by many car hire companies online. Vehicles can be picked up in town or at the region's main airport. Start by choosing where you'd like to pick up your vehicle in Kissimmee and then enter the dates and times of pick up and drop off. Add the type of car you prefer and the age of the principal driver, hit the button and you'll receive quotes from several operators. The nearest major airport to Kissimmee is Orlando International Airport, a busy facility that sees more than 30 million passengers annually. Located around seven miles east of Orlando, the airport boasts five terminals and handles most of the tourists flying to the area to visit Disney World, Kissimmee and other area attractions. 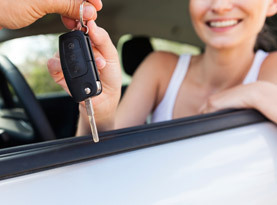 To secure the best deal for cheap car hire in Kissimmee it is important to book in advance, ensuring not only a good price but that a vehicle will be reserved for your arrival. After picking up your hire car in Kissimmee, you can head to Disney World or one of the many other area theme parks and attractions, all of which are easily accessible by hire car. Found just outside Orlando is the Universal Studios theme park, which is also a working movie studio. Special effects featured at the park reflect the work of Hanna-Barbara and Steven Spielberg. Popular rides and attractions at Universal Studios are based on Hollywood movies such as Jaws, Jurassic Park, King Kong, Popeye, Sinbad and Spiderman. In addition to the themed attractions, the Kissimmee area is well-known for outdoor activities including fishing and golf. Kissimmee in the summertime is hot and humid, with temperatures reaching 33˚C in July. The summer months also see the highest rainfall of the year, and from June through November the effects of tropical storms and hurricanes can be felt in the Kissimmee area, even though it is well inland. Winters are mild in general, with 8˚C the lowest average temperature in January.